Microsoft’s Hotmail team announced today that it has expanded Facebook chat integration with its web-based e-mail interface. 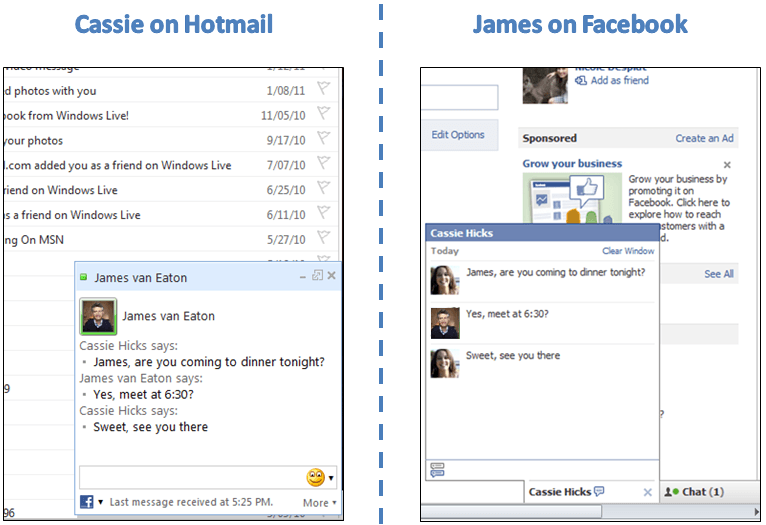 Hotmail users can now conduct chat with Facebook users in every region where Facebook is available. The feature had previously only been available in six regions and through the Windows Messenger service. Google’s Gmail allows for integration with AOL’s AIM chat service through its Google Talk client, but doesn’t currently offer support for Facebook chat. Hotmail launched the Facebook chat integration feature five months ago for users in Brazil, France, Germany, Russia, the U.K. and the U.S. Two weeks ago, it made the service available for users of Messenger, where Hotmail claims it caught on quickly, with 2.5 million Messenger users linking their accounts to Facebook. “And with three out of four Hotmail customers using Facebook, we expect that many more people will want to take advantage of this feature,” Craddock said. Grant it, switching tabs in-between chats probably hasn’t been on top of the lists of concerns for the majority of Hotmail users. But bored office workers whose employers have blocked Facebook may find it a very handy distraction, indeed. What’s more significant about the Hotmail chat integration announcement is that it shows that Microsoft and Facebook have a very amicable and healthy relationship. Perhaps we will be seeing more collaboration between the two behemoths in the near future.